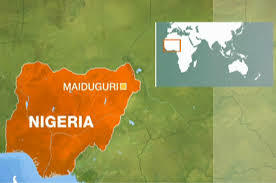 Over 30 people were reportedly killed in another suicide bombing at Kasuwan Shanu in Maiduguri, the Borno State capital, on Tuesday. The latest blast, which occurred at about 12:00 noon, according to officials of National Emergency Management Agency (NEMA) claimed 10 people while hundreds suffered various degrees of injury. But a source at the State Specialists Hospital in Maiduguri said over 30 were brought in dead and those injured are at the emergency ward. "We have received six corpses who died at the emergency ward since the injured were brought in and I just learnt that another victim of the blast has given up and they are bringing the corpse as we speak," a hospital said. Amina Sarki, a meat seller at the abattoir, said, "Oga, we just heard the blow and everybody started running. We know it was a bomb blast, we could not stay to count but those NEMA people who came immediately said 10 people were killed with many seriously injured."